Korres became a precious commodity in November, added to my routine as my skin was still irritated & I'd yet to accept that rosacea was a reality, but, this cream kept my skin hydrated and bright. 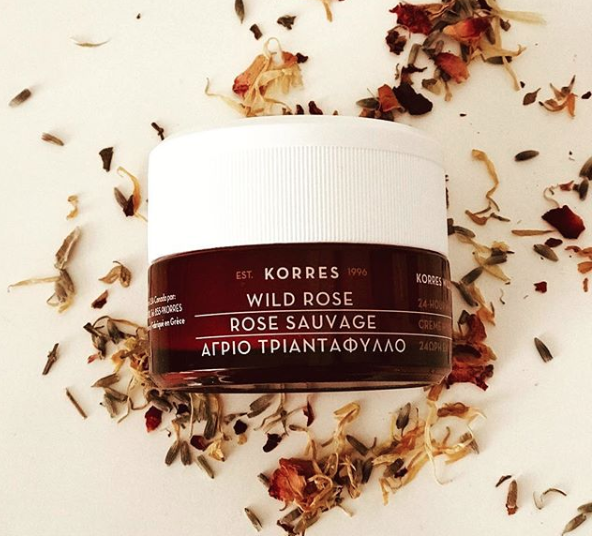 Korres Wild Rose Moisturiser certainly came up roses for me, the first point to note was it didn't cause any further irritation to my already unpredictable skin, it actually kept it very smooth, soft and brighter, which I embraced as all hopes of serious exfoliation left my routine. As I moved forward with a rosacea diagnosis, this wild rose moisturiser was the essential hydration I needed, with a serious amount of azelaic acid applied each evening I found my skin became quite flaky on the problem areas and the pleasure of applying this which immediately took away the tight feeling and flakiness has never left me. Certainly, the ingredients, including, Hyaluronic Acid aided the hydration of my skin and gave me texture back, rather than my face feeling like a stretched canvas. Vitamin C of the 'super' variety, is 1000% better than ascorbic acid, giving a luminous finish to the skin and my skin certainly willingly accepted every per cent and glowed beautifully, even with iffy areas, it's nice to still see my skin responding and looking at its best. The Wild Rose, itself, made for a smoother feel and look to my skin, with the white willow bark extract micro-exfoliating my skin and boy did it need it, after years of good old fashioned sloughing away dead skin cells, my skin welcomed anything gentle that at least showed those cells the door, politely. The scent is deep, warm and spicy, not floral at all, I like the serious bite which isn't over-powering. Korres Wild Rose is luxurious, creamy in texture and silky to the touch, this gives an immediate glow to the face, perfect under primer as it still offers a dewy look to the skin. The perfect answer to skin fighting hard to mend itself and this certainly helped mine as I have stated above, the richness I find soothing in this cream, it blends into the skin, taking away any dullness and flaky areas, a perfect pot in every way, used in conjunction with the serum you get a double hit of Korres magic (serum review coming very soon). I reached for this each morning and often when the azelaic acid had been on my skin for a few hours I would 'need' this applied, the acid works wonders, but, sometimes you do need something extra for the skin, this was my extra. Free from parabens, mineral oil, silicone, formaldehyde, formaldehyde-releasing agents, propylene glycol, ethanolamine, petrolatum, SLES, ALES, synthetic dye, phthalates, polycyclic musks, retinol, animal testing and animal by-products. 96.8% Natural ingredients. Dermatologically tested ophthalmologically tested suitable for all skin types, suitable for vegetarians and suitable for vegans. Korres have my heart with this pot, to see such positive results from very little of the product, less is more certainly applies here. The perfect pot in every way for me. *I am unable to take any responsibility if you suffer any problems or reactions from any products you may try that I recommend, my opinions and findings are personal to me.